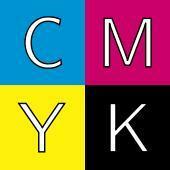 The four-color printing process uses four standard ink colors: Three primary colors, (cyan, magenta, and yellow, plus black (abbreviated as “K” for “key”). Using black ink provides shadow detail and reduces the amount of the primary colors needed to print dark hues. 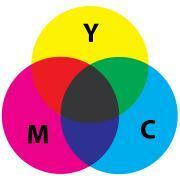 The three process-color inks are primary colors, which when combined can produce a fairly broad gamut. Cyan is a bright bluish-green, magenta is a bright purplish-red, and yellow is a clear, bright yellow. These colors are subtractive primaries, which means that when combined they absorb all light, resulting (theoretically) in black. This is contrasted with the additive primary colors (red, green and blue), which when added together as light form white light. 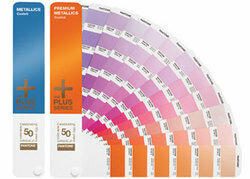 Full-color printing relies on qualities of color mixing and human color perception. It is the dominant method of printing that is capable of reproducing a full range of color, required for reproducing color photographs in newspapers, books and magazines. Four-color or process-color printing is contrasted with spot color printing, in which specific colored inks are used to produce the colors appearing on paper. Some printing presses are capable of printing with both four-color process inks and additional spot-color inks at the same time. High-quality printed materials, such as marketing brochures and books, may include photographs requiring process-color printing, other graphic effects requiring spot colors (such as metallic inks), and finishes such as varnish, which enhances the glossy appearance of the printed piece. The four-color process also relies on a graphic reproduction technique referred to as “halftoning,” which converts an image into a halftone image (or simply a “halftone”), a mosaic of tiny solid dots. The halftone dots can be seen by magnifying a black-and-white photograph printed in a newspaper. Areas which appear gray in a halftone, when magnified, can be seen to contain many tiny dots of black ink. The darker the gray area, the larger the ink dots. A solid white area has no ink dots; a solid black area has no white paper showing. With four-color printing, halftoning (also referred to as “screening”) allows lighter shades of the primary colors to be printed. Magenta printed with a 20% halftone, for example, produces pink, because the eye perceives the tiny magenta dots and the white paper between the dots as a lighter shade of the pure ink color. Without halftoning, the three primary process colors could be printed only as solid blocks of color, and therefore could produce only six shades: the three primaries themselves, plus three complementary colors produced by layering two of the primaries — cyan and yellow produce green; cyan and magenta produce blue (actually a purplish blue); yellow and magenta produce red. These subtractive complementary colors correspond to the additive primary colors. The reverse is also true: the complementary colors of the additive primaries, made by combining two of the additive primary colors, correspond to the subtractive primary colors — mixing red and green light produces yellow; mixing green and blue light produces cyan; mixing blue and red light produces magenta. Light is purer than printing inks, and paper used in printing is rarely pure white. Therefore, accurate reproduction of vibrant colors is easier to achieve on a computer monitor, which uses light, than in printed materials. Pure blues are difficult to reproduce with process-color printing. A rich blue color in a photograph may appear accurately on a computer monitor but is likely to appear muted and a bit more purple if the image is printed with CMYK inks.